INTRODUCTION The City of Atlanta Mayor’s Office of Sustainability (OoS) is requesting quotes from qualified, credentialed, experienced Landscape Architects and related Design Consultants (Exhibit A) to design and create a Community Vision Plan for the Urban Food Forest Park at Browns Mill. The Urban Food Forest at Browns Mill (UFF) is a 7.1 acre property which includes the parcels at 2217 Browns Mill Rd and 406 East Rhinehill Rd. After six-months of community planning and engagement, the City of Atlanta’s Office of Sustainability (OoS) (the "Client") will hire a design team (the "Consultant") to complete a Community Vision Plan for the Urban Food Forest at Browns Mill (the “Project”). The Project's design process will begin June 1st and be completed by September 30th of 2017. 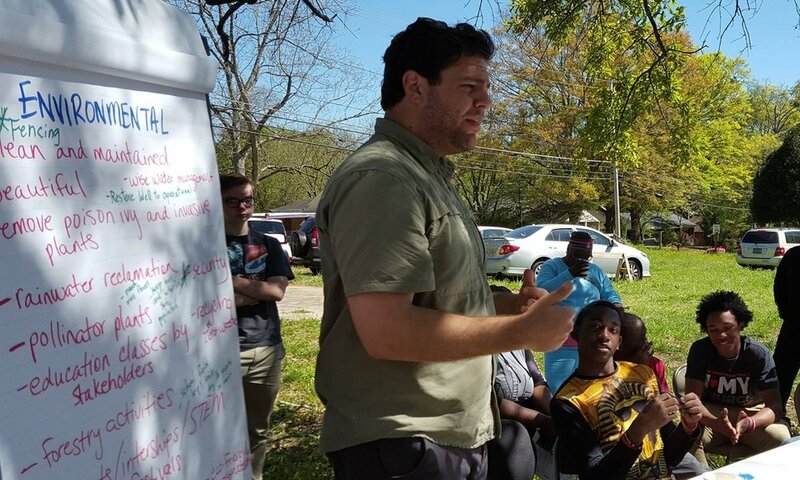 The Community Vision Plan for the UFF will provide the Client and community partners with a clear vision for transforming what is currently a property in a USDA Low-Income Low Access (LILA) food desert, into Public Park and food forest. (See Exhibit E & F). This edible oasis could incorporate: nut and fruit trees, berrying shrubs, vines, gardens filled with fresh vegetables, as well as native plants and habitat for pollinators and wildlife. The UFF will serve as a safe space for kids to play and neighbors to gather; a living laboratory for area schools; and offer job training and employment opportunities for neighborhood residents. This Community Vision Plan will incorporate and celebrate the historical, agrarian roots of this property; the needs, wants and desires of those who work, live and play in the neighborhood; as well as some of the best emerging practices for designing sustainable food producing landscapes today. This will be the first municipal park in the City of Atlanta to also serve as a community food forest and implement an organic land care strategy. All food forest related programs (gardening, eating, learning etc.) must be designed to continue for a minimum of ten years. As a City of Atlanta park, the UFF will incorporate ADA accessibility to include: walking trails, pedestrian and maintenance ingress and egress, and a percentage of the community garden beds. The Vision plan must account for current conditions such as drainage, sun, and soil. The City Park will also reference permaculture design principles, ethics, and techniques; best emerging practices in sustainable food production; and the rigorous standards in environmental design and performance set forth by the Sustainable Sites Initiative to become a SITES certified landscape (Exhibit C). The UFF aims to achieve at least a “SITES Certified” certificate. Phase 1 (June 1st – June 30th, 2017): Introduction to site and community 1. Kick-off Meeting between Client and Consultant: A) Meet on project site to preview. Follow with a sit-down meeting to: B) finalize project timeline including dates the Consultant will meet with Client and community stakeholders; and C) establish communication means and protocol to be used during the 4-month UFF Community Vision Plan process. 2. Collect, review and interpret inventory drawings and data for use in analyzing existing site conditions and future development of the site plans including the following documents that have been prepared by other consultants: A) the survey, B) arborist survey, C) soil tests, and D) pertinent information generated during the six-month community planning process. The Consultant will collect additional pertinent data including: site design constraints and allowances and accessibility needs. 3. Facilitate” Introductory Meeting": Within three-weeks of the start of the design process (June 24thth) Consultant will have met with the Food Forest Leadership Committee to: 1) clarify project goals, 2) clarify objectives of the design process, and 3) ask additional questions about the hopes, fears, expectations, desires and wants derived during the six-month community planning process. 4) Work with the Client to Identify Food Forest Leadership Liaisons to assist with disseminating information to community (ex: Facebook, NPU, Neighborhood Association etc.) 4. Conduct site assessment and analysis of existing conditions, ensuring aptitude of site conditions and how they relate to community’s and client's goals. Include: vegetation inventory, soils, structures, sun exposure, slope, aspect, likely drainage flows (high point, low point), right-of-way pavement edges, underground/above utilities, etc. 5. Consultant shall incorporate sustainable and permaculture design principles, ethics and techniques throughout the design process, which are provided in Exhibit ‘C”. 6. Consultant shall incorporate design standards to achieve SITES certification level “Certified” or better as seen in Exhibit “C”. Phase 2: (July 1st - July 31th, 2017): Create (2) Concepts for UFF Community Vision Plan 1. Produce two “Concepts” for the Community Vision Plan for the Urban Food Forest at Browns Mill: Utilize information gathered during the first month of the design process (ex: general site conditions, stakeholder input from the community planning process/ Introductory meeting with the Food Forest Leadership Committee etc.) to create two initial concepts for the Urban Food Forest at Browns Mill. 2. Present two "Concepts” for Urban Food Forest Community Vision Plan at a public community food forest meeting. Use public feedback to refine the initial concept for UFF in Phase 3. 3. Provide access to two initial concepts for additional public commentary. Phase 3: (August 1st - 31th, 2017) Refined Concept for the UFF Community Vision Plan 1. Produce “Refined Concept” for Urban Food Forest at Browns Mill based on community and stakeholder feedback from the initial concepts and the realities of site conditions (e.g. grade, soil, etc.). Consultant will add design features to comply with code, as well as suggested design features to enhance transitions, aesthetics, current trends in urban agriculture, etc. Spot elevation for structures. Additions are meant to improve the functionality and compliance of the Initial Concept with city regulations and ground truth. 2. Develop phasing plan and timeline for installation, include recommendations for the contractor role vs work that may be done by the community. 3. Develop budget estimates and permit requirements for each phase, so construction can be implemented over time. Deliver a cost estimate for the first phase of the Urban Food Forest Vision Plan expected to be implemented. 4. Present “Refined Concept” for review by the Food Forest Leadership Committee, and Client to ensure that the “Refined Concept” adheres to requirements, feedback and recommendations. Leadership Liaisons can present to NPU and Neighborhood Association as needed. 5. Present “Refined Concept” to Department of Parks and Recreation (DPR) for review and approval at Park Permitting and Design Review Meeting, held bi-monthly on the 2nd and 4th Thursday. Phase 4: (September 1st - 30th 2017) Final UFF Community Vision Plan 1. Develop and prepare 100% Final Community Vision Plan (36 x 48 vision plan color rendering, with call-outs to programs, site features, and amenities) a. Survey b. Three year planting plan: depicting planting strategy by season, for three years (Ex: Fall 2017, Winter 2017, Spring 2018, Summer 2018 etc.) c. Planting Pallet Index: plants identified by common and Latin name, shade/sun suitability, space and height requirements, and additional qualities that could be used to educate the public (ex: medicinal uses, ecological uses etc.) d. Refined budget by phase/season e. Schematic Irrigation plan f. Tree Protection and Replacement Plan (per phase) 2. Deliver a presentation for 100% Final Community Vision Plan (end of August). Work with the Food Forest Leadership Committee for event delivery. Summary of all Deliverables: 1. Phase One: Introduction to Site and Community a. Kick-off Meeting between Client and Consultant b. Collect, review, and interpret inventory drawings and data c. Facilitate “Introductory Meeting" 2. Phase Two: (2) Initial Concepts a. Produce two “Concepts” for UFF Community Vision Plan b. Present two "Concepts” for UFF Community Vision Plan at a public community meeting c. Provide access to two initial concepts online for public comment 3. Phase Three: Refined Concept a. Produce “Refined Concept” for UFF b. Develop phasing plan and timeline for installation c. Develop budget estimates and permit requirements d. Present “Refined Concept” for review e. Present “Refined Concept” to Department of Parks and Recreation (DPR) 4. Phase Four: Final 100% Community Vision Plan (36 x 48 color rendering , 3-year planting strategy, planting pallet index, refined budget by phase/season, schematic irrigation plan, tree replacement plan per phase) Project Fee: The budget for this procurement is less than $20,000.00 any quote received in excess of $20,000.00 will be deemed non-responsive at the sole discretion of the City. Nonresponsive quotes will not be eligible for award. Services include all printing and travel fees. Client will provide facilities for community engagement meeting. A 30-day advanced notice of meeting time is required. Client will provide refreshments for community engagement meetings. Client will pay Consultant the amount above once upon the completion of all Deliverables and acceptance by Client.